Product #20682 | SKU 027650-0100-110 | 0.0 (no ratings yet) Thanks for your rating! 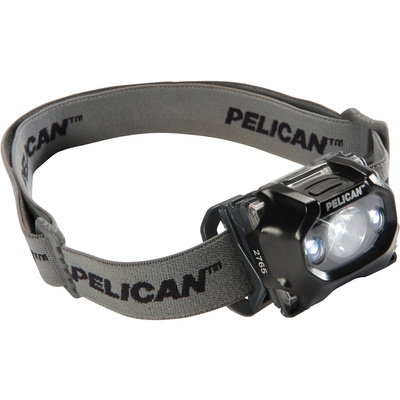 The black 2765 LED Headlight from Pelican is a compact and lightweight headlight providing three output levels including a downcast mode for illuminating the path directly in front of you. It also offers a flashing mode and tilting head design. Its maximum output is 105 lumens and its low mode provides a 65 lumen output. In downcast mode two LEDs provide a 33 lumen output. A full level battery indicator is supported and the headlight includes both a cloth and rubber headband for a variety of head and helmet applications. For use in dangerous situations, the 2765 is rated IPX4 for water resistance and certified Class 1 Division 1 for hazardous environments.